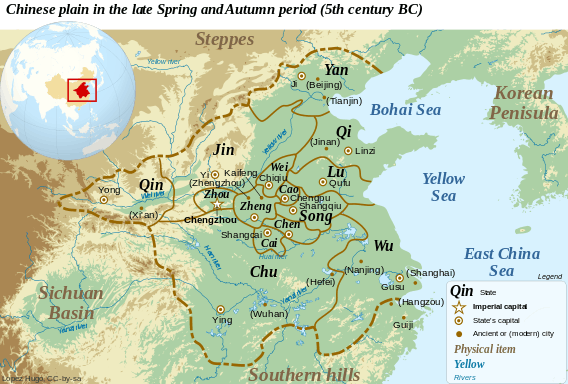 Cài (Chinese: 蔡; Old Chinese: *s.r̥ˁat-s) was an ancient Chinese state established at the beginning of the Zhou dynasty, rising to prominence during the Spring and Autumn period, and destroyed early in the Warring States period. Following his overthrow of the Shang king Zhou, King Wu of Zhou granted titles and territories to his younger brothers. The fifth brother, Cai Shu Du, was enfeoffed at present-day Shangcai (lit. "Upper Cai") in Henan. During the Three Guards Rebellion, he attempted to usurp the Duke of Zhou's position as regent to the young king and his defeat meant his deposition and exile. Du's son Ji Hu, however, proved a loyal and capable ambassador for Cheng and the Duke of Zhou, and they rewarded him with the reestablishment of his father's territory and title, which he was able to pass on to his own son, Ji Huang. As the Chinese peerage developed, Cai was initially considered a county and then elevated to a march; it was never able, however, to become a duchy or kingdom in its own right. Invasions from Chu during the Spring and Autumn period relocated Cai several times, first to Xincai (lit. "New Cai") in 531 BC and later to Xiacai (lit. "Lower Cai") at present-day Fengtai in Anhui. In 447 BC, King Hui of Chu conquered Cai completely, but allowed the marquesses to settle near Changde in Hunan and establish a rump state called Gaocai (lit. "Great Cai"). This was destroyed 80 years later. With the spread of surnames to all Chinese during the Qin dynasty, many people from the former state took the surname Cai in memory of their former home. These former subjects have undertaken two major migrations. During the Huang Chao Rebellion against the Tang in AD 875, the Cai clan moved to Guangdong and Fujian. A later migration occurred when the Ming loyalist Koxinga relocated many Cai officers to Taiwan in the 17th century. The rulers of Cai were all descended from the Zhou imperial Ji family and – after the first three – held the rank of hou ("Marquis"). "History of Chinese surnames: Cai" at People's Daily Online. Accessed 10 December 2007.